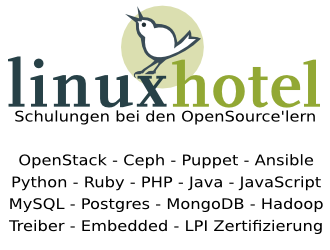 If you are interested in participation in one of the next Linux Presentation Days then first have a look whether there is a web site for your country yet. If so then follow the instructions there. If your country does not have a web site for the LPD yet but is listed among the participants then contact the main organizers in Germany in order to get the contact person for your country. The information below is for organizing the LPD on a national level. There is also a page with information for the hosts of local events. Contact the main organizers in Germany. Someone should be added to the European mailing list. You should register linux-presentation-day.cctld for your country code top level domain if we haven't done that yet (and in addition business-linux-presentation-day.cctld). Except from linking to www.linux-presentation-day.org you are completely free in how you create your national web site. You should set up a national mailing list for confirmed and potential participants. It makes sense to have two mailing lists: one for official information for the participants (which can be written to by only one person so that it has little traffic) and a discussion list for those who are interested in discussions and not afraid of much traffic. Every hosting organization should set up an event page as soon as possible. See this simple example page or this one for conditional participation. Try to find other organizations (not necessarily Linux user groups) in at least two to three cities in your country which will participate so that there will be a few people with LPD experience who can organize a nationwide participation for the following event. Translate at least the most important information (both for visitors and participants) into your mother tongue. The recommendations from the German LPD web site will be translated bit by bit but maybe you have people who understand German or you may use a translation service. Make a list of the confirmed and one for the conditional participations. Support interested organizers in finding the necessary resources (helpers, room, computers, sponsor) by pointing out on that web page what is needed for which locations for having the Linux Presentation Day there. Set up national social media accounts. Like the national web site these will mainly be used by the Linux community in the beginning. Try to make your IT media cover the event about two months in advance in order to find more locations and sponsors. For your first event it probably doesn't make much sense to contact the nationwide media (for several reasons). Decide (especially depending on the sponsor situation) whether you want to produce national printed material (posters, stickers, flyers) or whether you want to get the international, English version (pointing to www.linux-presentation-day.org) from the German organizers. Make sure that the organizers contact their local press in a suitable way short before the event. You should decide whether you organise just a single location for your first event or try to start with several locations. Both approaches have pros and cons. It is an important point that organising the LPD does not cause too much effort (both on the level of a single event and on the level of national organising); it is important that the audience like the event but it is even more important that the hosts like organising it. It is no use if the LPD causes national (and usually even local) organisers so much effort that they decide to leave the next event and participate once per year only. Convincing more hosting organisations should become easier after having had the first event. Different groups of potential hosting organisations may differ in how easily they can be gained for a first event. I guess that associations can be easily convinced but adult education centres, universities and schools may prefer joining an existing event. A lot of organisations have been asked (and most of them not even responded) before the first one in a new country commits to participating. Probably there are people in every FOSS-related organisation who like the LPD concept but they may be afraid of saying something (on their mailing list) because they might end up having to do the work. Furthermore usually several people are willing to help during the event but don't want (or don't have the time) to organise it. Thus it is more or less coincidence whether an organisation participates in the LPD and the decision can easily change e.g. by hearing about what happens elsewhere (in the same country). So it makes sense to inform the others after the first commitments are there, especially because the responses to national enquiries are much better than to those from abroad. This should be done in a nationwidely coordinated way, of course. Each participating organisation should inform other suitable organisations in its area, especially the ones which have already been contacted by the international LPD organisers, and (in case they do not participate) invite them to their own event. If a hosting organisation (or just one of its members) is in contact with suitable organisations elsewhere then such organisations should be informed, too. They should be given some time to respond before the other organisations are informed. In addition to inviting the nearby organisations the committed hosting organisations may offer to them joining their local LPD organising mailing list so that the probably later responsible people elsewhere already get a good impression what organising an LPD event can look like. So before the press release there should be a "community release", at least at the first few events.